COLUMBUS, Ohio – While more consumers want healthier beverage options, they’re also concerned about the safety of how those beverages are preserved. Health-conscious consumers want great tasting, healthy drinks that don’t include chemical additives and preservatives with names they can’t pronounce. Researchers in the College of Food, Agricultural, and Environmental Sciences (CFAES) at The Ohio State University are seeking to remedy that issue. 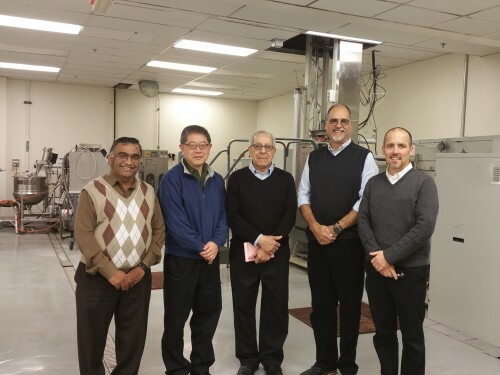 A team of CFAES scientists has been awarded a four-year, $891,000 grant from the U.S. Department of Agriculture’s National Institute of Food and Agriculture to develop an innovative manufacturing technology that will preserve food and beverages using wholesome, recognizable ingredients, no artificial preservatives and reduced use of heat, all thanks to a type of high-pressure-based shear technology. Called Ultra-Shear Technology (UST), this new method will allow beverage companies to manufacture healthier beverages by reducing thermal exposure through the combined application of elevated pressure, shear, and controlled times and temperatures. And it’s not just drinks that might soon be preserved in a much healthier way. UST can also be used by food manufacturers in the healthier processing of sauces, condiments and other foods, said V.M. “Bala” Balasubramaniam, a CFAES professor of food engineering who is leading the research project. His laboratory, with a multidisciplinary team of microbiologists, chemists and nutritionists, investigates innovative food technologies and then works with industry to implement them. “Health-conscious consumers pay close attention to ingredients in beverages and tend to avoid products perceived to contain artificial or chemical-sounding ingredients, although such ingredients may be scientifically proven to be safe and functional,” Balasubramaniam said. With a projected global population of 9.1 billion people by 2050, meeting the growing demand for beverages and other foods with substantiated health benefits and consumer-desired quality attributes is a major challenge, he said. “Development of cost-effective, next-generation, gentler industrial food manufacturing technologies for the preservation of healthy beverages is a critical need,” Balasubramaniam said. Known internationally for his research on high-pressure and other types of nonthermal processing, or safely processing food using significantly less heat, Balasubramaniam holds joint appointments in the CFAES departments of Food Science and Technology and Food, Agricultural and Biological Engineering. Other members of the CFAES research team include Ahmed Yousef, professor of food microbiology; Rafael Jimenez-Flores, the J.T. “Stubby” Parker Endowed Chair in Dairy Foods; and Christopher Simons, assistant professor of sensory science. The team will collaborate with scientists and engineers at Pressure BioSciences Inc., a Massachusetts-based company that manufactures high-pressure-based equipment and laboratory instrumentation for the life science industry. Edmund Ting, a senior vice president at the company, will lead the development of the laboratory-scale and pilot plant equipment that CFAES researchers will use in the research project. “It has been rewarding to see the significant growth of high-pressure processing in many areas of food processing over the last 25 years,” Ting said. “I believe UST has equal if not greater applications than high-pressure processing, both within and outside the food and beverage industries. The UST equipment developed under the research project will be used to demonstrate the technology to the beverage and food processing industry through pilot plant demonstrations and testing, Balasubramaniam said. UST will also be shared with food processors through webinars, short courses and food processor fact sheets.